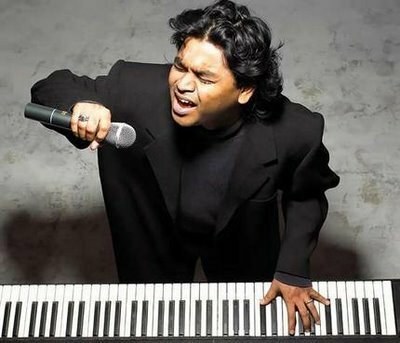 A.R.Rahman’s composition – even if the track is new. For the sake of a formal introduction, he was born in a middle class family, in Madras, as A.S. Dileep Kumar. Though being born a Hindu, his family was devoted to a Sufi saint. This made an Allah Rakha Rahman out of an A.S.Dileep Kumar. And then the tragedy struck – he lost his father and the family lost its earning member. They began living hand-to-mouth with A.R doing all kinds of jobs including playing violin at the local recording studios. The year was 1992 when Mani Ratnam, the Madras based director, came with Roja and he needed a new sound for his film. Rahman composed and the rest, as you know, is history. Then offers starting gushing in from Mumbai. Andrew Lloyd Webber’s Bombay Dreams, a musical version of The Lord of the Rings, Chinese director He Ping’s Warriors of Heaven and Earth, 1857: The Rising and the list goes on. And to top this come the Best Original Score and Best Original Song awards at the 2009 Oscars for the film Slumdog Millionare. And now, A.R. Rahman and Hollywood filmmaker Danny Boyle will work together, to create a part of the score, for the opening ceremony of London Olympics 2012! For this Honorary Fellow of the Trinity College of Music, how has all this success changed Rahman, who went on from being a boy engrossed in listening to his father’s diverse collection of long playing records to an icon in World Music? Well, in terms of wealth and other tangible assets yes! But that’s not all. Rahman stands for change. In a prolific industry where the demands are colossal, how can a man produce such magnificent and diverse music even after so many years? His ability to adapt with the times makes his stay longer. It’s seems like a paradox, but change and permanence go hand in hand. The essence of his music lies in playing with the notes on his keyboard like a child playfully makes discoveries. When the world is lulled into deep sleep after a day of work, this wizard begins working in his studio until the Sun wakes up, listening to this Mozart of Madras.